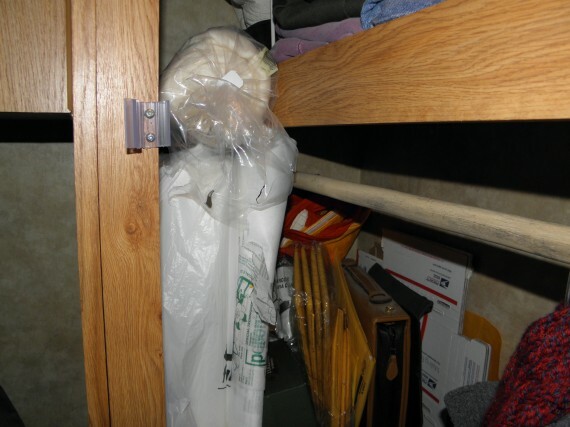 I have had several people email me recently asking me how I manage to find the space to sew and quilt in my tiny RV home. 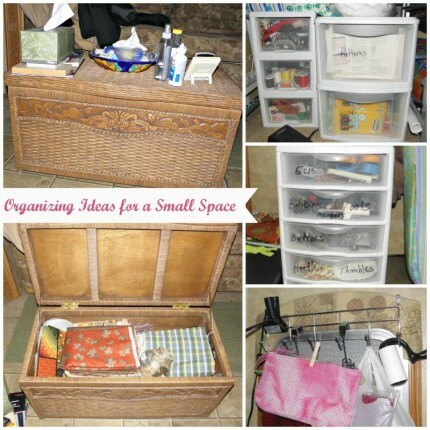 One of the ways is to be organized, with a place for everything. 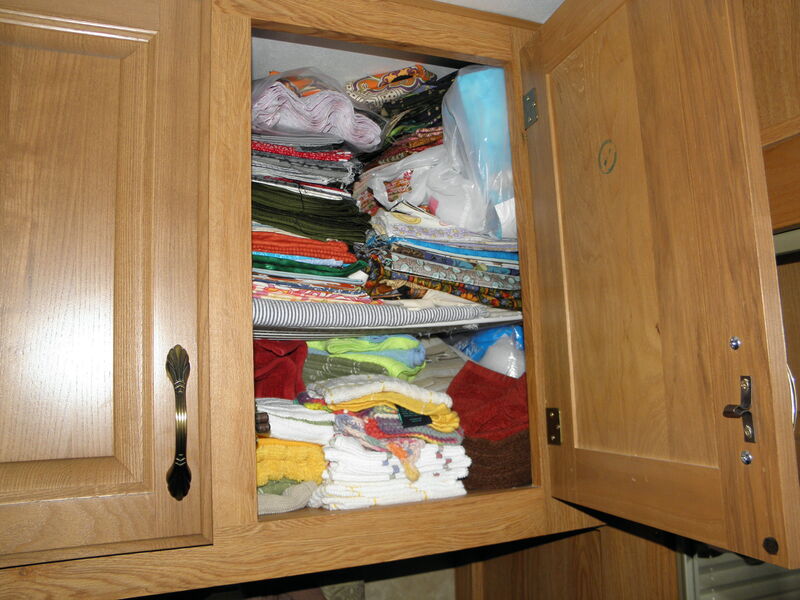 On the left side of the table, there is a space about 5 inches wide, that is the perfect place to store my folding chair and counter top ironing board when they are not in use. 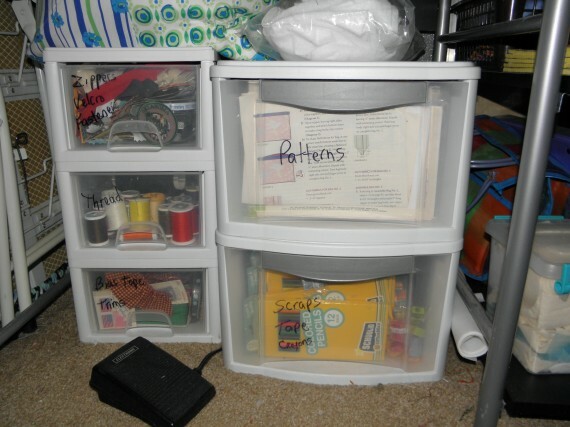 Under the table, I have two stacks of plastic drawers for holding sewing notions and supplies. On the dresser within easy reach, I have a stack of smaller drawers that hold small but necessary notions that I use all the time when I am sewing. Things like scissors, bobbins, needles, markers, buttons, and measuring tapes are literally at my fingertips. 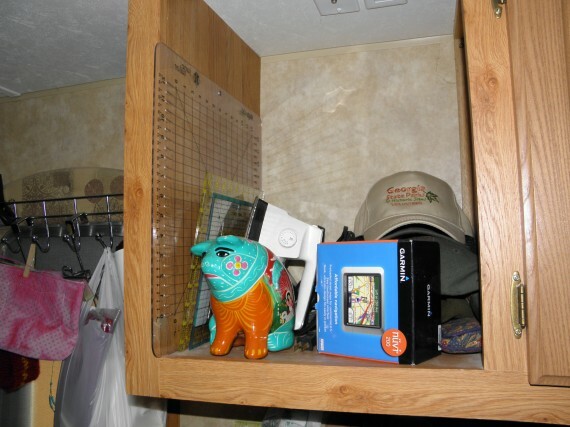 Although you can’t see it much, the stainless steel dish on top of that drawer stack has a strong magnet in the base–it holds my pins in place even while we’re traveling down the road. You can get a really good one at an auto parts place–it was intended as a dish to hold nuts and bolts. 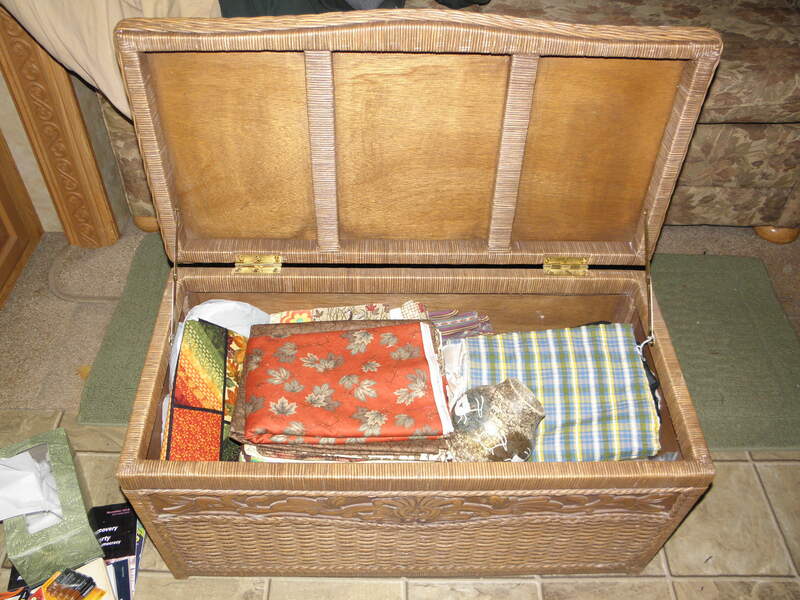 The larger drawers under the sewing table hold zippers and other closures, thread, bias tape and trims, patterns, and fabric scraps. The little container on the far right holds scraps of batting that I use when making cosmetic bags, and other smaller items. We have never watched TV in the bedroom, so that little cubby hole is used for storing my rulers and iron, among other things. An over the door rack holds projects in the works. I found a nice sturdy over the door rack that fits over the cornice board at the back door of the trailer. 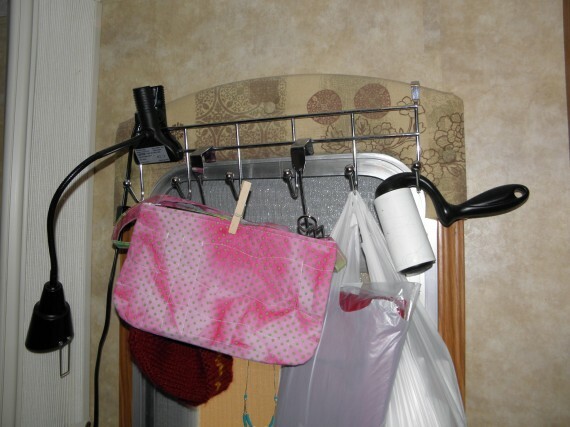 I use it to hold things like projects in the works, a clip on light for my sewing area, a bag of fabric, and a lint roller. That lint roller is THE BEST for picking up all those little threads and pieces of fabric when I am through sewing for the day! You might not be able to see this clearly, but this is where I store bolts of interfacing and batting. I buy things like that when they are on sale at Joann Fabrics for 40-50% off. There are three bolts in there right now, with room to spare for some mailing supplies like padded envelopes, and priority mail boxes. They really don’t weigh a lot, but because it is a bolt, it is pretty large. Keeping them in the wardrobe closet is a pretty good option. Who needs that many towels? When we travel, everything is packed away. 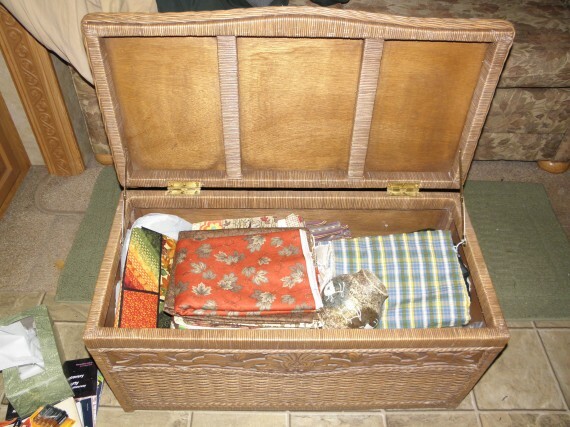 The sewing machine, the folding chair, the ironing board, the rulers and iron, all go under the bed. All of the plastic drawers are on the floor, in front of the back door. The sewing table is either put on the bed, or in the back of the truck, depending on how long we are going to be traveling. 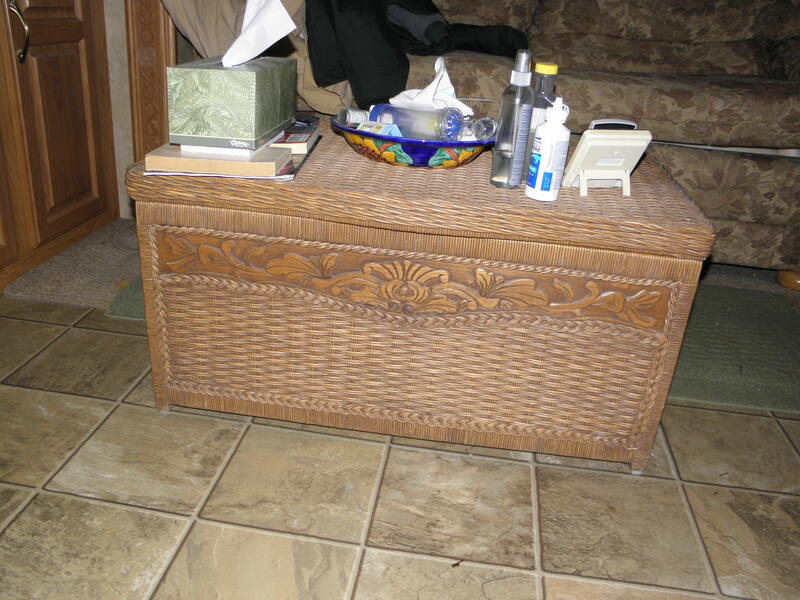 The wicker trunk is pushed sideways next to the door. In the more than 10 years that we have been traveling, everything has always stayed put while we were going down the road. 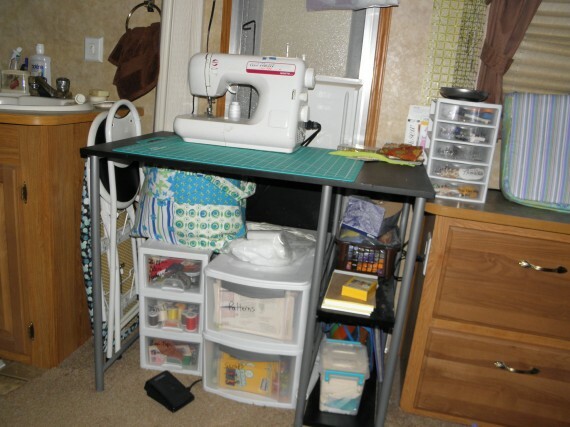 The next question people always ask me is “How did you get your husband to let you have all that space for sewing?” Well, the answer is, he knows this is what makes me happy. If I were a fisher woman, or a kayaker, I would make space for the items I needed to be able to enjoy those activities. 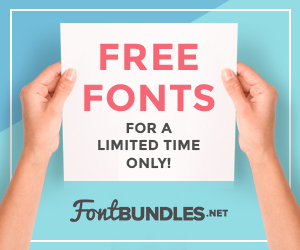 I am a crafter and quilter–I need these tools and supplies to make me happy. Life on the road is not just travel–if you can’t have the things you need to make you happy, no matter what that might be, you might as well just stay home. Nice organization there, Karen, and nice words about living on the road. That’s why I have cabinets for cameras, binos, bird books and a scope! Different strokes for different folks! I haven’t checked your etsey store, but do you make custom quilts to sell? Clever ideas, Karen and excellent advice for those of us contemplating life on the road. My mom and I spent quite a bit of time in JoAnn fabrics on Saturday. She’s a quilter, too. I bought fabric to make a new apron for when I do my baking. I’ve been trying to organize as I pack into the new RV. But trying to find the right size vinyl coated shelving and racks isn’t easy. Have bought a lot of tubs to store things in both in the shed and the RV basement. Trying not to overload, but I Need my Beads and books and Mike needs videos, DVDs and tools. Great ideas, I especially like the table you found at Walmart, I’ll be looking for it. Fantastic organizing skills. If I can use the space of a molecule for storage I will. Seems you have the same talents. All I can say is… I’m impressed! I’ve always used ‘not enough space’ as my excuse for not sewing. You’ve blown that one out of the water! 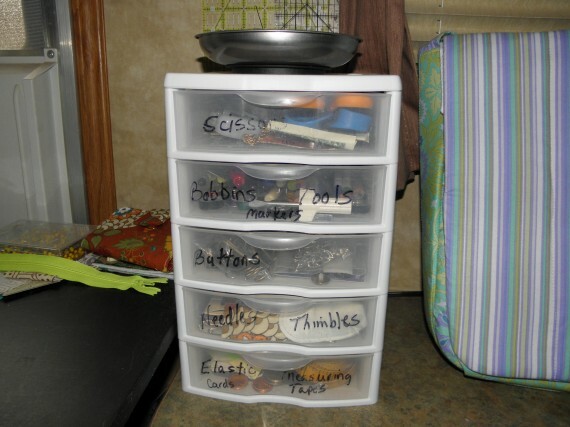 Great organizing tips, even for those of us who aren’t seamstresses and who don’t live in an RV! Very well planned out. 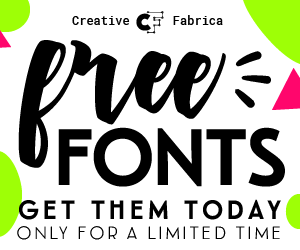 You’ve shown how it is possible to sew,create,and even shop with fabric in mind. Thanks for sharing!